One of the biggest mistakes many people make in caring for houseplants is overwatering. The soil becomes over saturated and the roots drowned from a lack of oxygen. The result – roots die off, leaves begin to yellow and fall off. That’s what happens to plants indoors. Is there any difference between indoor plants and outdoor plants? 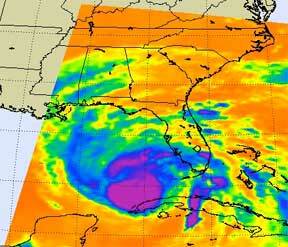 At the moment we’re in the middle of hurricane season with storms spinning off or near the Florida coast. One thing a hurricane and tropical storm brings is water in the form of rain which end up standing for days and wind, sometimes constant and other times in gust. Plants inside and out may experience some of the same symptoms from the stress of over watering. Plants outside usually bounce back and come back with a renewed vigor. The same cannot be said for indoor plants. Both the indoor and outdoor plants don’t receive the same amount of air movement so we can eliminate the wind comparison. However, we can identify one difference. With high winds, plants outdoors – trees and shrubs – do receive a “natural” pruning and a loss of leaves and sometimes major branches ! With some of the landscape canopy removed from the storm the landscape can begin its recovery. But now plants have more roots to support less foliage – sometimes called root to shoot ratio they can put all the “stored food” and energy into growing more branches and foliage to even out the root to foliage balance. From a water perspective, both indoors and in the landscape the plants receive way more water than needed. The difference in the landscape, comes from nature’s ability to allow the roots to dry out as the water recedes. Plants may be sitting in water for a few hours or days but eventually the soil will dry out and the roots can get the needed oxygen. What can we learn from hurricanes and tropical storms on caring for our houseplants? Plants can handle a lot of water IF the water can be drained from the root area. Indoors without holes in pots for drainage the water sits and slowly rots the roots. Make sure your pots and planters have a way to drain off the excess water. That also goes when planning your landscape design. Make sure you factor in drainage when landscaping with decorative pots and planters, they also need a way to drain off excess water. Indoors think of double or cache pot for houseplants. Take some time and learn about watering your plants from Mother Nature.